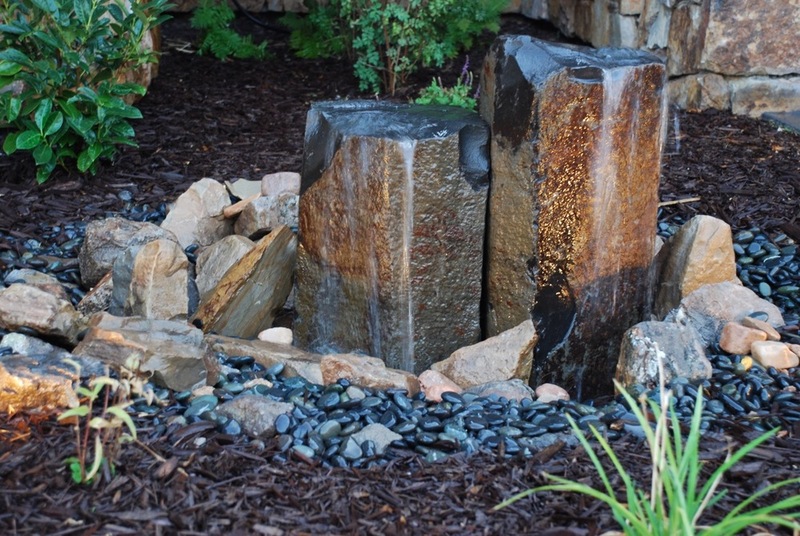 Platinum Landscaping has designed and installed some of the most beautiful water features here in Salt Lake City and for clients all over Utah. Living around and enjoying your water feature(s) will become a cherished time for your family. The sound of the water and the beauty of it can have a transforming effect. Our goal is to create an ecosystem that is largely maintenance free. We install, where possible, an auto fill valve that automatically monitors and adjusts the water level for your Salt Lake City pond or fountain system. Each system operates by recirulating water from the top to the bottom. This recirculation creates oxygen and does not allow for stagnation. With evaporation and splashing, small amounts of water are lost and the auto fill valve keeps the proper levels. Throughout the year, as the weather changes after Salt Lake City pond installation, the environment tends to experience algae blooms. This is a natural occurrence any time water and heat exist. Algae will be found in any natural pond and is part of the ecosystem. If the algae begins to get out of hand, it can be easily treated. Take a tablespoon of Clorox and put it in the water. This should begin to dissolve the algae. Several applications may be needed to bring it back in balance. The biggest variable to your Salt Lake City pond installation is ensuring that you create and maintain a natural ecosystem. This means that the system needs to run 24/7 and that the conditions we have talked about are monitored. For those of you with a pondless system, many of these maintenance issues do not apply. As debris enters the pond, it will float into the skimmer box or settle to the bottom. Where possible, especially in areas where there are many trees, try and keep the pond clean and the debris out. Twigs, paper, garbage and plastic bags, if not removed, will get stuck in the impeller on the pump and plug or block it. A weekly check is usually all that is needed after Salt Lake City pond installation (do it when you mow the lawn) to keep it clean. As winter rolls around, you can either keep the system running for your Salt Lake City pond system or shut it down. If you want to keep it running, no damage will result. You WILL need to use a hose to manually fill the pond because the Auto Fill Valve will not work since it is connected to the sprinkler system. You should check the level once a week. The combination of running water with snow and ice is often breathtaking. Should you choose to shut it down, simply disconnect the power and leave the pump in the pond. Platinum Landscaping of of Salt Lake City, UT can create a fire pit or other fire feature you will love for a lifetime. Fire features are a fantastic focal point for any landscape area. They create visual interest and provide the perfect counterpoint to water features, ponds and swimming pools. One of the most popular options for a fire features is the fire pit. Built as a raised structure from either brick or stone the fire pit provides a central point for a sitting or dining area. 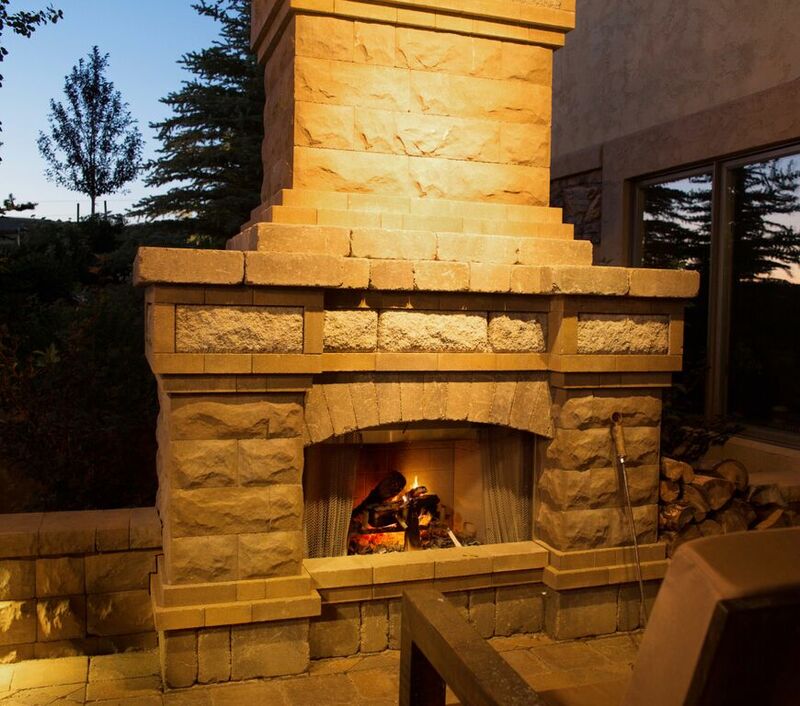 Ideally, our Salt Lake City fire pit installation is connected to the natural gas supply. This means the size of the flames can be controlled via a Dante valve and there is no need for messy clean ups as required with a wood burning pit. The flame is created by a customized stainless steel burner which is covered over with glass or stone pebbles. A fire feature is a less formal version of a fire pit. It can be incorporated into a garden or as part of a water feature. A fire feature can be built into a bowl, a garden area or from natural stone. A fire feature is less of a gathering place and more of an interesting element of the overall design for your Salt Lake City landscaping or hardscaping project.